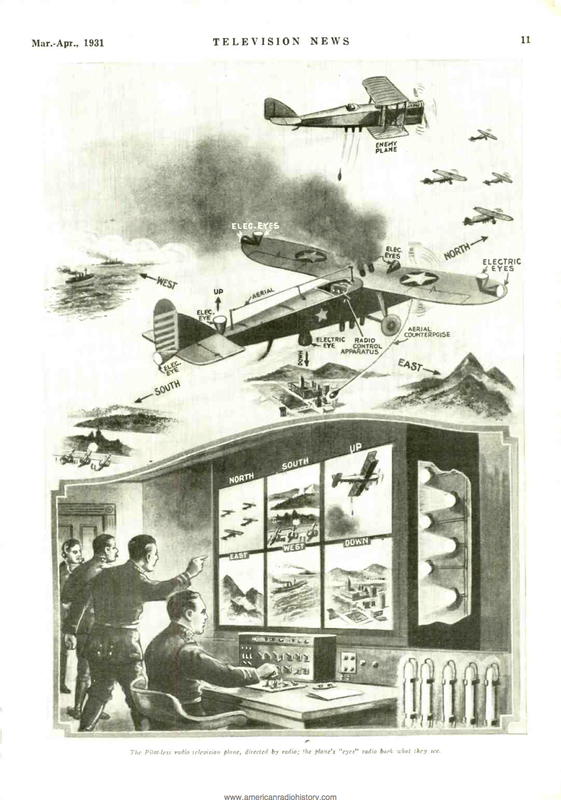 I’ve written before about the long history of drones (UAVs or RPAs, if you prefer – and the Air Force does prefer), and the unrealised intersections between remotely-controlled aircraft and early television: I’m thinking of Archibald Low‘s experiments with what he called Televista in 1914 and his trial pilotless aircraft (codenamed ‘Aerial Target”) in the dog days of the First World War. I had assumed that the connections did not materialise – and even then in very precarious ways – until the closing stages of the Second World War with the US Project Aphrodite, which I discussed briefly in ‘Lines of Descent’ (DOWNLOADS tab). If, for instance, an enemy airplane suddenly comes out of a cloud and starts dropping bombs on our machine below, the control operator sees this enemy machine quicker 500 miles away, than if an aviator sat in the cockpit one-quarter of a mile away from or below the enemy bomber. The control operator will send a radio signal that will immediately discharge a smoke screen from his radio television plane, hiding his craft in smoke. ‘As a matter of fact, the radio-controlled airplane is with us today. Several of the leading governments have already in their possession airplanes that can now fly and stay aloft for any length of time, within reason, without a pilot or any human being on board. Gernsback’s “Telimco Wireless” didn’t receive the signals of any broadcast radio stations, since there were almost none before 1920. But it did ring a bell in an adjacent room without any connecting wires. Such was the sensation the device made that local police demanded a demonstration, following up on a fraud complaint. Satisfied that it worked, the Telimco was subsequently sold in many department stores … until the first World War, when the government banned amateur wireless transmission. But he was soon fascinated by television; he launched Radio News and then move on to Television News as platforms for his ideas and enthusiasms. 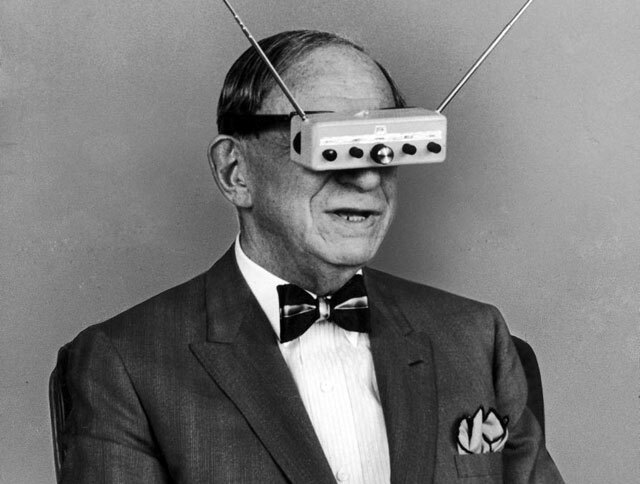 The image above shows him in 1963 wearing his ‘television glasses’. He died the following year, or he might have invented Google Glass too. This entry was posted in air wars, drones, World War I, World War II and tagged Archibald Low, bombing, drones, Hugo Gernsback, remote control, television, Televista by Derek Gregory. Bookmark the permalink.